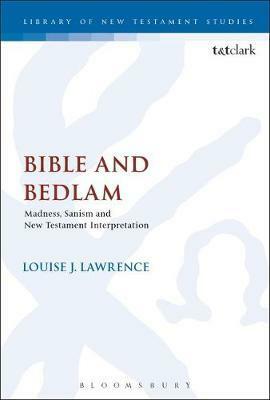 Bible and Bedlam first critically questions the exclusion and stereotyping of certain biblical characters and scholars perceived as `mad', as such judgements illustrate the `sanism' (prejudice against individuals who are diagnosed or perceived as mentally ill) perpetuated within the discipline of Western biblical studies. Second, it seeks to highlight the widespread ideological `gatekeeping' - `protection' and `policing' of madness in both western history and scholarship - with regard to celebrated biblical figures, including Jesus and Paul. Third, it initiates creative exchanges between biblical texts, interpretations and contemporary voices from `mad' studies and sources (autobiographies, memoirs etc. ), which are designed to critically disturb, disrupt and displace commonly projected (and often pejorative) assumptions surrounding `madness'. Voices of those subject to diagnostic labelling such as autism, schizophrenia and/or psychosis are among those juxtaposed here with selected biblical interpretations and texts. Louise J. Lawrence is Associate Professor in New Testament Studies at the University of Exeter, UK. She is the author of, among other works, Sense and Stigma in the Gospels: Depictions of Sensory-Disabled Characters (2013) and Reading with Anthropology: Exhibiting Aspects of New Testament Religion (2005).